These illustrations in the inside cover of two pamphlets entitled ‘Now You Are Ten’ really caught my eye. The pamphlets were designed and produced for London County Council and distributed to pupils in the area. They are in the National Union of Women Teachers (NUWT) Collection, Reference number UWT/D/28/B/3. Although the options given on the diagram are the same for girls and boys you can already see the gender roles being played out in the objects shown at the feet of the pupils. The girl is shown with a ball of yarn and knitting needles, a sewing kit and a book. 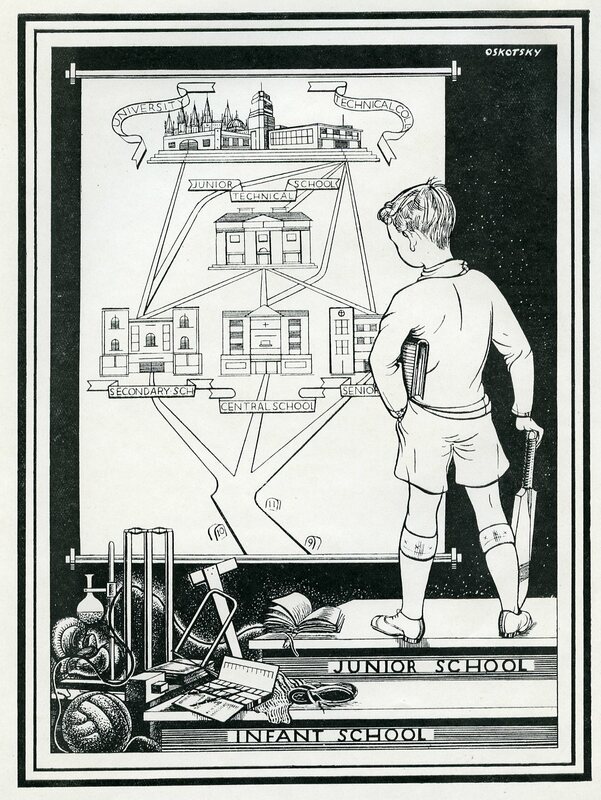 Whereas the boy is holding a cricket bat, and beside him there are woodwork tools, chemistry equipment and a football. Ok, so there’s nothing groundbreaking in this display of gender roles in a pamphlet from 1936 but because both books being the same way (quoted below) I did initially wonder if it might be an attempt to change perceptions of male and female choices. “You are now ten years old… Do you know that this year may be one of the most imporant in your whole life at school? I want to explain why, and to set out some of the chances and choices before any Lodnon child who is about the same age as yourself”. However by page 4 the gender assumptions are back. Both pamphlets are describing the facilities for pupils. In the girls pamphlet we read about rooms for domestic subjects and in the boys, yes, you’ve guessed it, rooms for woodwork and metalwork. 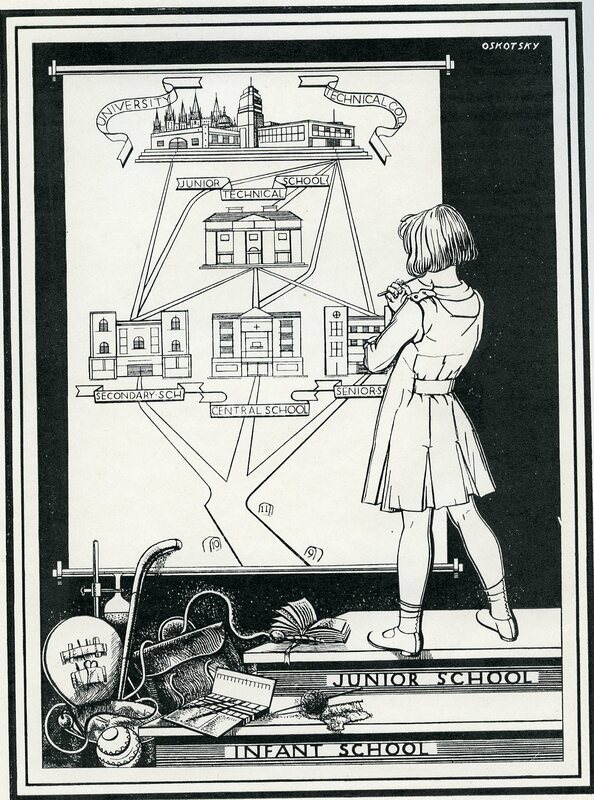 The same gender roles are played out in the descriptions for Central Schools – in addition to Mathematics and Science girls can study ‘Cookery, Laundrywork, Housewifery and French’ and for Boys – ‘special training is given [for work] in commercial offices and trade and industry’. I know there was nothing unusual then about this deliniation of roles but I just thought these illustrations highlighted it perfectly so I wanted to share them! That’s really interesting, would have been quite a profound statement for such an early publication if the pictures ended above the children’s knees- showing that opportunities and lifepaths are not determined by biology! Yes, my initial reaction when I glanced at the drawings was one of amazement that it seems to be showing that both girls and boys had the same chances and opportunities but sadly, as I looked down the drawing I realised how mistaken I had been!